This French lot dates back to 1982, and debuted on vinyl for Axe Killer Records in 1984. Or rather guitarist Frenzy Philippon did. In 1989 the band disintegrated but, as is soon customary, Philippon revived the band in 1996 bringing in lead vocalist Nathalie Greyer and drummer Vince Kohler, who are still in. The bass side has been more turbulent and it was only 2011 that Hungarian bass player Matt Gabnai came aboard. 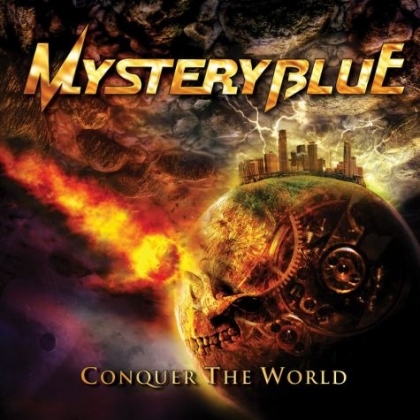 Will 2012 be the year of MYSTERY BLUE? It is soon apparent that the major influences are those of most heavy metal fans (in alphabetical order); ACCEPT, JUDAS PRIEST and RUNNING WILD. The drums courtesy of Vince are really some of the most triggered of 2012, which may or may not please your ears as Ms. Greyer has an almost metallic voice. The first half of the album has everything going for it, groovy refrains, massive riffs, even echoes of KING DIAMOND in “Evil Spell”, which sadly is the weakest moment of the opening six. As the album progresses the best gunpowder seems to have become wet. There is still a massive feeling, but the likes of “Road of Despair” and “Guardian Angel” are simply not up to par. But the band remains true to their metal roots and to their favorite bands and performs an ok album.